Dist: 34.4 mi. Avg spd: 15.4. Cad: 85. Conditions: 30 degrees F, partly cloudy, breezy. Route: E on 56th St, S on Guion Rd, S on Lafayette Rd, E on 16th to Methodist Hospital; S on Capitol Ave, E on Market to Monument Circle, W on Washington St, N on Bridgeport Rd to Chapel Glen; N on Country Club Rd/Dandy Trail. iPod listening: The Eagles, Crash Test Dummies. Notes: It was the coldest ride of the year--so far. I dressed warmly and it was a relatively pleasant ride. I rode to Methodist Hospital in Downtown Indy to visit a parishioner in critical care. 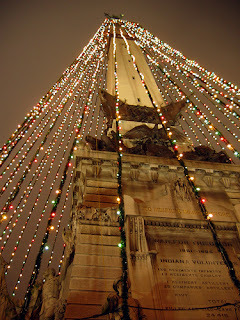 I made a few circuits around Monument Circle, where the holiday lights will be switched on tonight. I rode west to the suburban neighborhood of Chapel Glen to visit another parishoner going through chemotherapy. Then I rode home. A good holiday afternoon ride. My old black touring Cannondale (which I rode 2000 miles through India) is great for such rides.